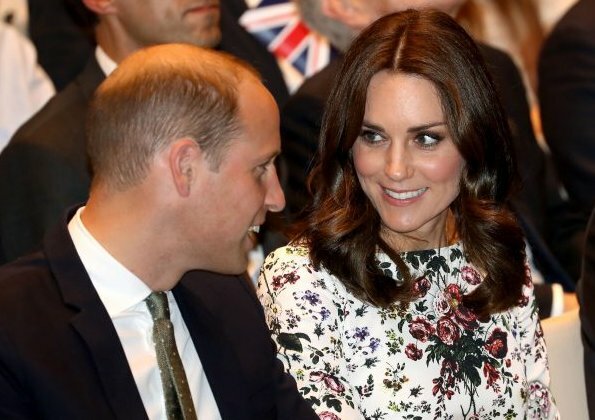 These claims depend on the smile forced by Prince William to the words "We will need to have a new baby" said by Kate after Kate accepted a toy given as a gift to her during official Poland visit of the Royal Couple last week. 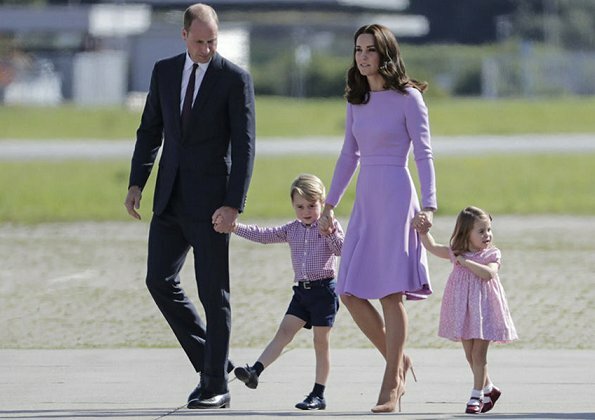 Having Kids which is a family planning organization wrote a letter to Kate and Prince William which states that they should rethink to have a third child and that they shouldn't have a third child. In the letter, it is said that "All of us, especially public personalities should plan our families considering future environment and we should have a less and more flexible population which may be successful in that future environment". The organization wished the royal couple to forgo having a third child and to help a child of a different family in making a fair start in life. It is not the Having Kids organization's business to lecture William and Kate on whether or not they should have a third child. I would throw their letter in the trash. Me too! That letter is an impudence! Agree. Actually that kind of letter would cause me more to have that extra child than not. It will be interesting to see what happens now! Catherine is from a close and happy family of 3 children. William is from a troubled marriage of 2 children--although he and Harry seem close. All this speculation began with her joking about having another child when they were given a presente of a new technology meant for newborns while in Germany. The rest is the media trying to sell papers or get clicks on their website. It is unlikely that this very private couple would make such a disagreement (if it exists) so public. 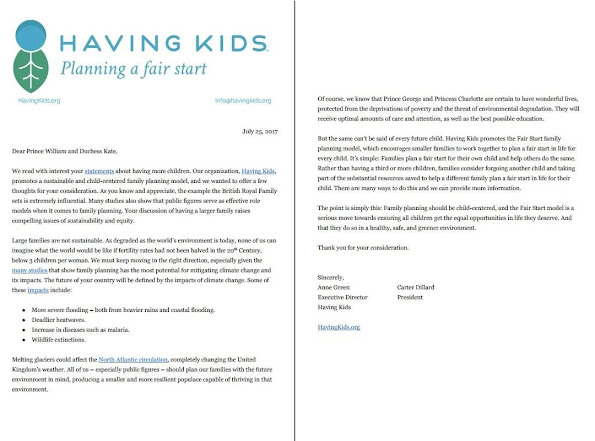 The Having Kids organization is just using the joke to get media attention. Best to ignore them. Ça ne nous regarde absolument pas. Please let them have a third child if they want to. Raising children is a wonderfull mission. I absolutely agree with Beverly24...NO organization or individual has the right to taught the royal couple or any couple about whether or not they should have a child. Have a child is their private decision. Please let them have a third child if they want to. It is their private decision. And bringing a new life to this world and raising a child is a wonderful mission. What is this organization? Who are they to lecture anyone on such a private manner? Typical of loonies from the far left and far right. Im critical about the royals as much I am about everything/everyone but this organisation should mind their on business!! I totally disagree. The royal family is supposed to set an example. If they head organizations that preach conservation (as Prince Charles does and I'm sure William will also) then they need to set an example to slow the over population on a world with ever increasing limitations on water, agriculture, and animal extinction. It dependa on the country. Mine Has only 11 millions. Se have a aged population. Not many young people. The goverment wants woman to have more babies. The world overpopulation is majoritly cause by countries like US, índia, China... These countries are the oned that need to have less children. The "aged" countries need more. If the olderly dies, we dont have enough adult working people. Its about balance. Agree Raquel. My country has only 5,5 million people, only 18,1 persons in km2. We have problem that too little babies born to pay old people´s pensions in future. The letter was just a suggestion. The same as when people say "you should have more kids" or that letter would make me want to have an extra one. Which, by the way, isn't the best reason to have another child. I'm sure the Duke and Duchess know what is best for them. People can say whatever but this is the royal couple (people) that have it hard! Kate made a little joke but that was enough for orgabisations to write open letters to tell her that she shouldnt have another child. Yikes! No creo nada de esto. Son chismes que se inventa la prensa para vender porque en verano escasean las noticias.